Discussion in 'Electric Vehicles' started by domenick, Jan 20, 2010. Tired of electric vehicle designs that don't quite flip your buttons? 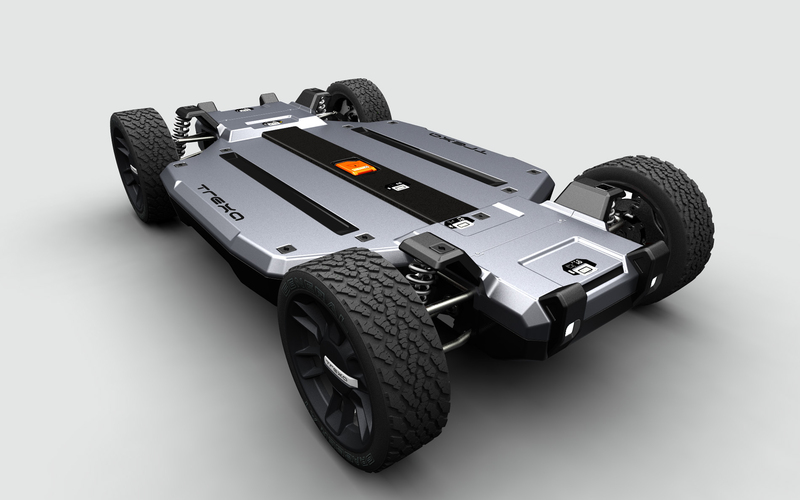 How about you develop your own starting with a lithium-powered all-wheel-drive platform from Trexa. I've got a little more technical info than what's in the post. Let me know if you want more specs. Regarding the price Trexa says, "The platform price varies depending on the number of features selected. (Trexa plans to release specific pricing later this year.)" I expect it's expensive but it comes with a developer's kit which includes CAD models and interface hardware among other things. This looks like the 2002 GM surfboard concept the Autonomy. Here's a link to a photo gallery. Electric vehicle platform maker TREXA has just unveiled a new production prototype in conjunction with its filing for a patent for the company’s unique Enertube energy storage system. 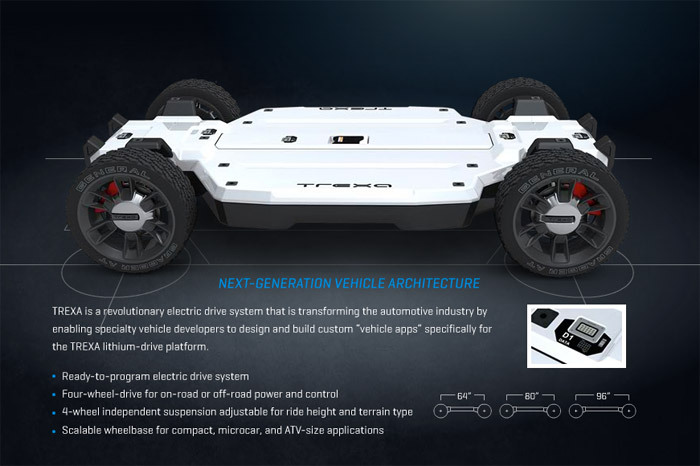 TREXA’s Enertube is a tubular chassis frame that serves as both the backbone of the vehicle platform and a housing for a scalable battery pack. Edit: moderators have merged the two threads so you can see their old rendering and their new prototype. Quite a change from the concept to the execution. Note, that tube doesn't seem big enough to hold a lot of battery capacity. When they say 'scalable' do they have plans to add more battery capacity in parallel tubes or something like that? Somehow their old chassis looks more evolved/finished than the new one. Given that the image of the "old chassis" is just a rendering, it's not surprising that it looks more finished than something they actually built. AutoblogGreen also has some bigger pictures in the gallery accompanying their Enertube post. Also, expect to hear more from them before too long. Ah, OK. Fatter tubes if you want more range. Those don't seem to be 18650s in there. why not add more tubes in parallel? Whether or not this is important, this platform makes battery switching impossible. ernst 't is een grijze. Battery switching impossible? Maybe not, empty stick out fresh stick in. So, umm, where does the body attach to this thing? Attaching along the spine is not seem structurally sound. So, umm, where does the body attach to this thing?